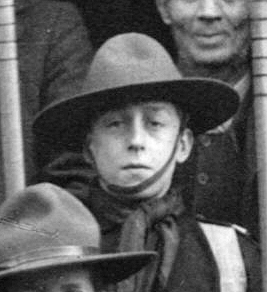 Wilfred Challands, aged 10 or 11, as one of the first troop of Boy Scouts in Bottesford. 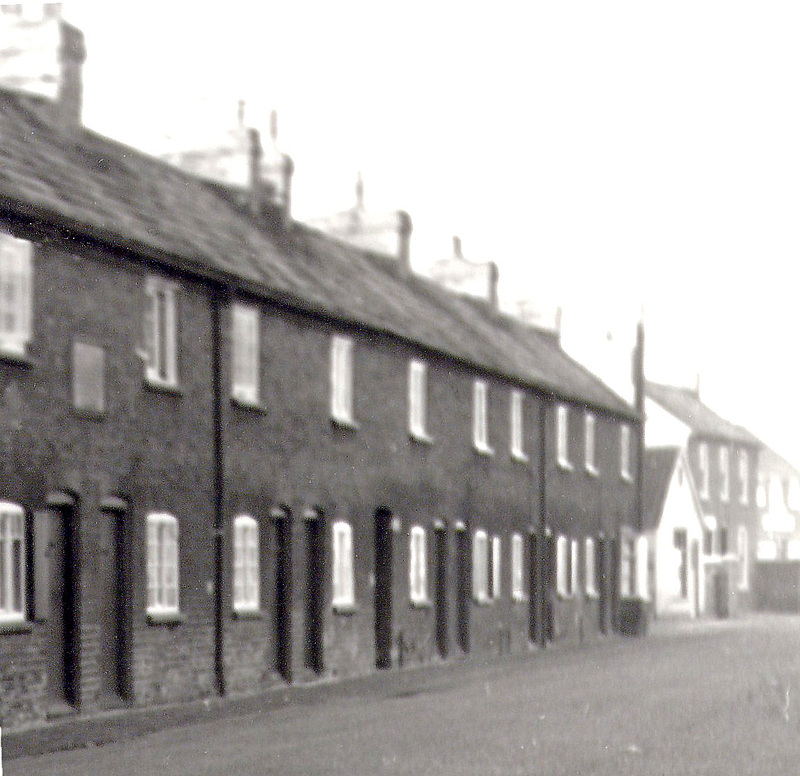 Here is seen in a photograph parade in front of old cottages (demolished) in Church Street. Picture from the collection of Mrs Brenda Turier, identification from the Bottesford Scouts archive, courtesy of Mr Ian Kitchener. 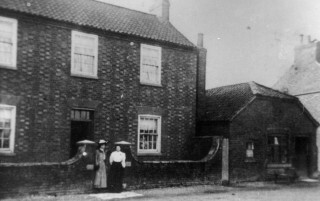 William Miller's House, Bottesford High St, photographed around the turn of the century. Part of the pre-1900 detailed map of Bottesford, showing the location of the Miller's house and the adjacent terrace known as Jackson's Row. Butcher's Row, formerly Jackson's Row, Bottesford High St. looking westwards. The General Register of Births, Marriages and Deaths (the BMD) records that Wilfred Arthur Challands was born in the third quarter (July, August or September) of 1899 in the Grantham registration area (which includes Bottesford), that he married Miss Dora Churm, in Derby, during the 1st quarter of 1924, and that he died in 1967 aged 69, also at Derby. Dora Challands (nee Churm) was born in 1896, and died in 1990, aged 94. In the 1901 census of Bottesford, Wilfred Challands was living at the home of William Mills and Annie Mills, at 41 High Street, Bottesford. He was their grandson, implying that their daughter had married a member of the Challands family. However, neither parent was at the house on the date of the census, and there is no indication of why this was the case. William Mills was a bricklayer, born in Bottesford about 1843, and Annie, his wife, was born about 1844 at Thorpe in Lincolnshire. Their household in 1901 also included their son Arthur Mills, a railway porter born in Bottesford about 1869, and uncle George Hollingsworth born in Sibthorpe, Nottinghamshire, about 1814. The census does not record which of the Mills he was uncle of. A broader examination of the 1901 census for Bottesford High St. as a whole shows that the Mills lived next door to, or conceivably opposite to, the home of William Miller, the butcher, whose home is now Mulberry House, No.23, High Street. 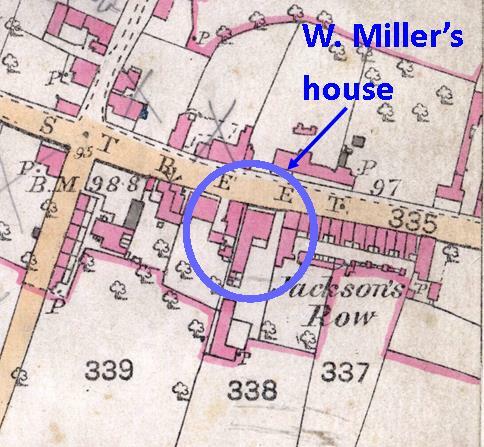 The Mills’ home may have been the westermost house in the terrace known as Jackson’s Row (later called Butcher’s Row), roughly where No.21 High St is today. By the time of the 1911 census, Wilfred’s grandfather William had died. Wilfred now 12 lived with grandmother Annie Mills and her son Arthur Mills. This census did not record the address, other than that the family lived in Bottesford. He was a founding member of the Bottesford Boy Scouts troop, led by Charles Calcraft, another who went on to serve in WW1. In both census, Wilfred is present as a grandson, and the identity of his parents is not clear. However, the earlier censuses (1891, 1881) indicate that William and Annie Mills had a older daughter, born 1874 in Bottesford, Alice Annie Mills. In 1897, she married Frederick Challands. She died in 1967 in Melton Registration district, aged 93; he died in 1942 in Melton Registration district, aged 78. They must surely have been Wilfred A. Challands’ parents. In 1901, Alice and Fred lived at 39 Lyndhurst Road, Nottingham, where they had a baby daughter Edith A., less than a year old. Fred was a bricklayer. In 1911, they are back at Bottesford, at 30 High St, where they have with them four children: Edith Annie 10, Harry Mills 8, Eric 4 and Doris Edna 2. Fred was again a bricklayer. It is not clear why Wilfred remained with his grand-parents. It might be that he was illegitimate, but if that was the case why was his birth registered in the 3rd qtr 1898 when his parents were married in 1897? This question remains unresolved. There is no indication that Wilfred Arthur Challands was a close relative of George Ernest Challands, who also served in WW1. Indeed, the fact that their names appear widely separated on the ‘church organ list’ of Bottesford WW1 servicemen suggests that they were not. The Challands were a large family with members at a number of addresses in Bottesford and Muston. Wilfred’s father, Frederick Challands, was a son of George and Ellen Challands, who lived in the Bunkers Hill cottages in Easthorpe, whereas George Ernest Challands was a son of William and Sarah Challands, who lived in Woolsthorpe Lane, Muston. The only information located so far (RNVR Other Ranks Medals Roll – National Archive) is that Wilfred A Challands served as Ordinary Telegraphist Z/7182 Bristol, RNVR (Royal Naval Volunteer Reserve), and that he was awarded the Victory and British War medals. There is no certainty as yet that this is the same man as that was born in Bottesford (there could have been more than one Wilfred A Challands in the services during WW1), though there is every chance that it is. He was only fourteen when the war broke out, and have enlisted or been conscripted in 1916 or later. The Electoral Register of Spring, 1921, records William A. Challands living again on Bottesford High Street. There was also a Frederick Challands at an address on High Street, most probably the same one though in the absence of house numbers from the register this is not certain. Then, between Spring and Autumn of 1924, Wilfred Challands moved to 74, St. Thomas Rd, Normanton, in the Derby constituency, where he lived together with Annie Churm and Thomas Churm. Wilfred’s wife Dora (nee Churm) was not included at this address, but it is not certain why.